Aurora Borealis Forecast. Everything You Need to know. When and Where are the Northern Lights Tonight? Here's Everything You Need to know. . .
Auroras are difficult to predict with precision. They have stops and starts (known as sub-storms). If you are out there, you need to be patient and lucky. Here are some tools that will increase your chances. The Space Environment Center's Neural Net Program estimates that . . .
Get Aurora Alerts customized for your location. Now, find the Kp number line on one of the following maps that matches the Kp number predicted above. If you are located at or above the estimated Kp line, you are in the right spot. You might even be in luck if you are located within next lower line, but you will have to look lower on the horizon. Be aware though, ground based light pollution and weather will have a greater impact at these more marginal locations. It's a good sign if you see a thick aurora band with some areas of light yellow, orange or, better yet, RED on this map as opposed to just a thin (or transparent) band with only dark green. The size of a visible Aurora will be bigger than what is shown on this map, because the map gives the overhead location of the Aurora. The area of a visible aurora is greater because it can be seen at spots other than 90 degrees directly up (straight above your head). The Aurora might be visible at 45 degrees, 30 degrees or even lower on the horizon depending on its brightness. Bz is the solar wind's magnetic orientation in the up/down direction. Although an Aurora can happen with a positive Bz, a negative Bz is generally better. A negative Bz helps the solar wind grab the earth's magnetic field which can more easily lead to an Aurora. So a negative Bz is good. The more negative the better. Each number in the diagram below represents a rolling 5 minute average of the Bz taken along the length of the solar wind stream. This data comes from a satellite about 1 million miles from earth. These 5 minute stream segments are all headed towards earth. They should arrive in 20 to 40 minutes. They are given in the order they'll hit earth, with the first 5 minute average hitting first. Think of each number representing a 5 minute long cloud of solar wind speeding towards earth. Remember, it's best for Bz to be negative, and the more negative, the better. Inbound Bz averages. The number closest to earth will hit first. Want free access to the Aurora three day forecast? While they have seen Auroral sub-storms as far down as Cuba, realistically north is where you need to be. The stronger the Aurora the more south one can see it. 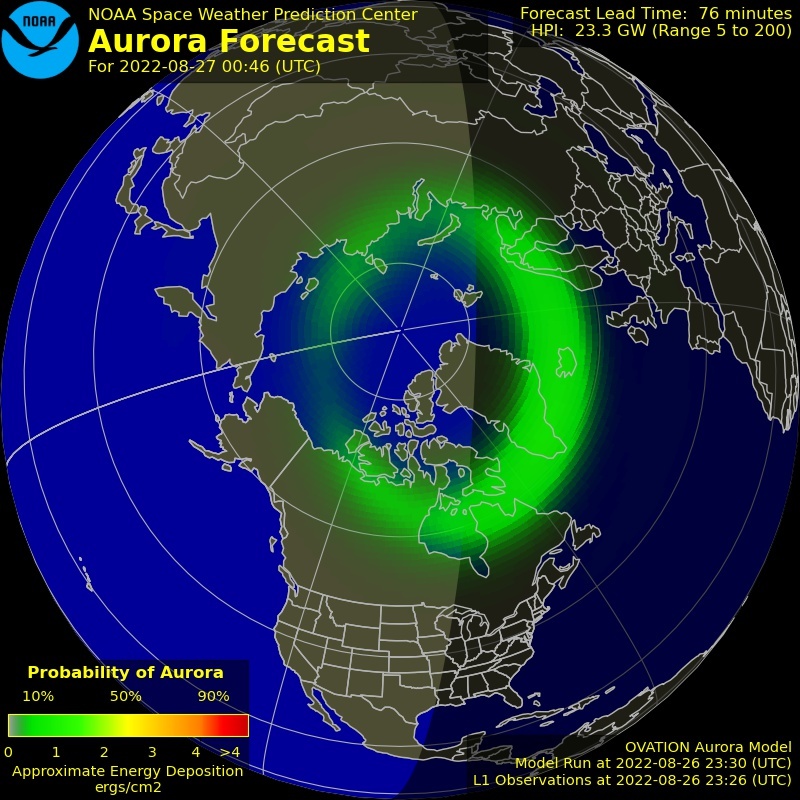 Check the Kp maps (above) and the size of the aurora oval (also above). Also, if you're not sure which way is north, don't forget to bring a compass. Let's say two months from now the Aurora is flaring up in your area -- the sky is ablaze with greens, violets and reds -- but instead of watching it, you're home sitting on the couch. Why? Because you simply didn't know about it. That's one of the problems with seeing the Aurora. It doesn’t run on a schedule. Often Auroras happen with only 30 minutes warning. That's why it's important to have a partner watching out for it for you. Someone who will watch the Aurora data, then, notify you immediately when the conditions are right for your area. 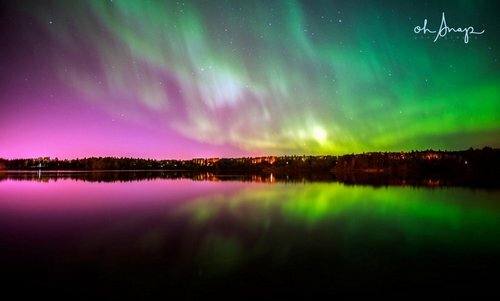 If you're serious about experiencing the Aurora, get Aurora Alerts customized for your location.